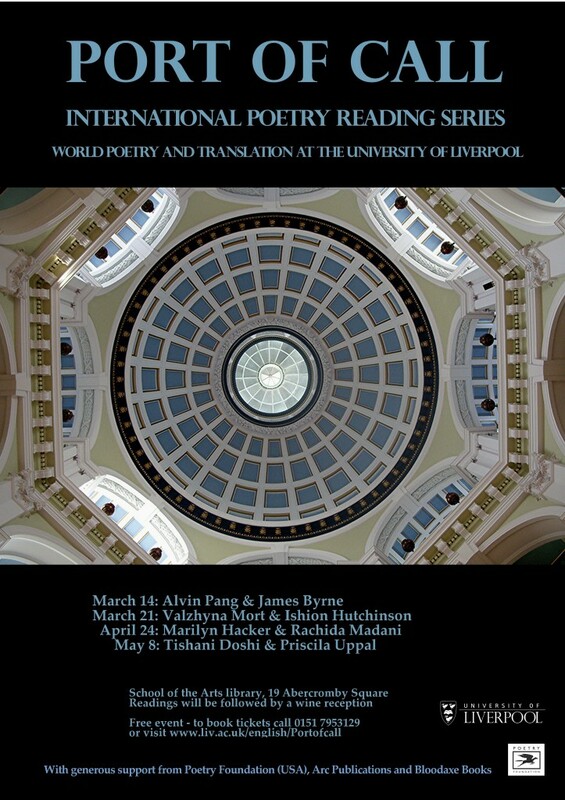 The University of Liverpool’s ‘Port of Call’ international poetry reading series features eight international poets and translators from India, Singapore, Canada, Morocco, France and the United States for an exciting programme of readings and discussions. Singaporean poet Alvin Pang and British poet James Byrne (translator of Burmese poetry) will read for 20 minutes each followed by a Q&A and a wine reception. Belarussian poet Valzhyna Mort and Jamaican poet Ishion Hutchinson will read for 20 minutes each followed by a Q&A and a wine reception. American poet Marilyn Hacker and Moroccan poet Rachida Madani will read for 25 minutes each followed by a Q&A and a wine reception. Canadian poet Priscila Uppal with read with British-Indian poet Tishani Doshi for 20 minutes each followed by a Q&A and a wine reception. Admission is free but booking is advisable. To book a place please rsvp by email to Filomena.saltao@liv.ac.uk stating which events you wish to attend. Please come and join us to hear these exciting international poets! This entry was posted on 28 February, 2013 in homepage and tagged International Poetry Reading Series, James Byrne/Alvin Pang, Marilyn Hacker/Rachina Madani, Port of Call, Tishani Doshi/Priscila Uppal, Univeristy of Liverpool, Valzyhna Mort/Ishion Hutchinson. Bookmark the permalink.